When I saw the recently released S scale Budd Co. passenger cars from American Models running on our club layout, I was very impressed! American Models has raised the bar for S scale plastic models one more time. The detail work on exterior of the car, the interior detail, and the fully sprung passenger trucks all contributed to this new level of detail on S scale ready-to-run passenger cars. Shortly thereafter I acquired a four car painted but unlettered set for my layout. Note they are also available lettered for a number of roads, and you can choose between hi-rail or scale wheels. 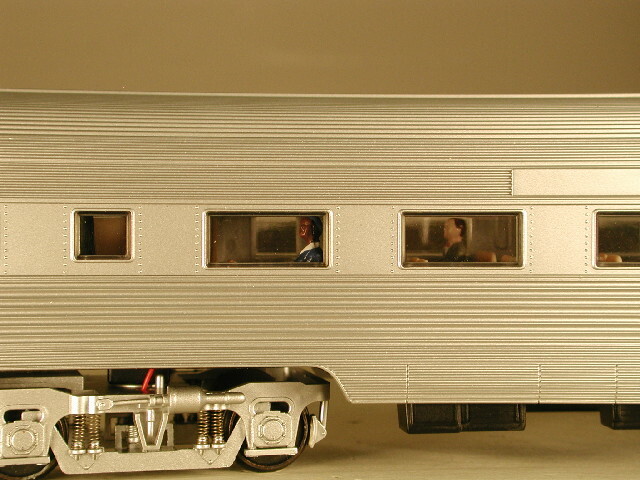 In hi-rail they are chromed cars, while the version with scale wheels comes painted with silver paint. The four car set includes a diner, coach, railway post office (RPO), and an observation car, with extra coaches available. The cars are factory supplied pre-wired with all wheel pickup and interior lighting, which makes this upgrade much easier. 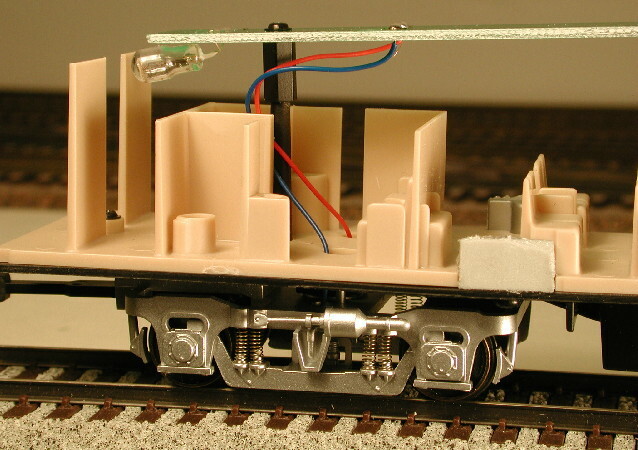 For some time now I have thought about adding DCC decoders to passenger cars to provide extra features like dimmable lighting, control of other lighting, and perhaps in the future some sound and animation effects. When Lenz Electronik GmbH release their LE077XF ultra-small decoder last year, I knew that these decoders would be ideal for passenger cars. I placed a sizeable order with my dealer to get a quantity discount, and drive the price below $20 per decoder. The size of the decoder is: L:0.53" (13.4mm) x W:0.39" (9.9mm) x H:0.14"(3.3mm). Such a small size would be easy to hide in a passenger car. And with two independently controllable functions plus motor control, it provided a nice decoder to control the lights plus other items TBD. 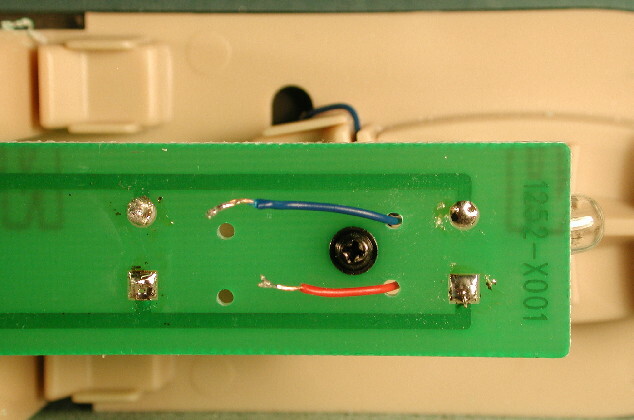 select and install an appropriate sized resistor in line with the light board. The reason to do at least one of these is to reduce the current load placed on your DCC system, when the bulbs are started "cold". The inrush current on cold bulbs can be up to ten times the normal running current draw. This means that each car could place up to a 2A load on your DCC system at system startup or restart. If you had a string of 4 of these cars, that could add 8A of current draw at startup, a condition that would force some smaller DCC systems to report a short on the track. But that was an aside -- let's get back to the project at hand. For this project I will leave the American Models supplied bulbs installed, since each car will be under the control of a DCC decoder. Perhaps a future upgrade project will be to replace the bulbs with more prototypical passenger car lighting. On first thought, you might think that I used either the F0 or F1 to control the lights. While that would have been possible it would have required a small amount of additional electronics. The functions on the LE077XF (like many other decoders) are only rated to provide 100mA of current. In order to use either F0 or F1, I would have needed to install some additional electronics, such that the function would actually control a relay that would provide track power to the lights when the function was turned on. This is certainly not a very difficult task, as we have used this same approach to provide power to smoke units in American Models Pacific locomotives when we have installed DCC. But using a function to control the lights would give me very limited control of the lights - either off or on at full intensity. Instead I connected the light board to the motor wires on the decoder. The LE077XF is rated to provide 500mA of continuous motor current which is more than enough to run the lights without additional electronics. And this approach gives me complete control of dimming the lights -- from completely off to completely on, and 128 steps in between. In addition, using the motor leads for the lights leaves F0 and F1 free to control other effects if desired. American Models has made access to the interior very easy. In the next photo you'll see the bottom of the passenger car. Look for the four screws, two next to each truck. Remove these and the shell can easily be removed. In the next photo you can see the car with the shell removed. Then I used my soldering iron to disconnected the power pickup wires from the light board. Carefully keeping the colors on the same side as they were, I ran these wires up through the new holes I had drilled. At the rear of the car, I drilled TWO pair of extra holes as shown in the next photo. As you can see, in one pair of these I ran the power pickups, again carefully keeping the colors on the same side they were on originally. The other set of holes will be used for the rail pickup wires from the decoder. Now is a good time to double check that once you have finished this, that both blue wires are on the same side of the board. Than I spliced in some wire to make the power pickup wires at the front of the car long enough to reach the rear. Here's a close-up. Note the heat shrink tubing over the solder joint, and the Scotch tape holding the wires in place. The next step is to "hang" the decoder. I used a very small piece of 0.5" wide double stick foam tape to hold the decoder. Put the foam tape on the micro-processor side of the decoder, since the other side of the decoder will generate heat as current flows. The micro-processor side is the side with the large chip. This next photo shows the decoder hanging on the light board. Look to the right, behind the passengers. Once you have the decoder in place, you now need to connect up the wires. I ran the red and black wires from the decoder up through the other set of holes I previously drilled in the light board. I cut the wires shorter (to approximately the length needed), and then soldered the appropriate three wires together -- the decoder's black wire and the two red wires from the American models pickups. Then soldered the other three wires -- the red wire from the decoder, and the two blue wires from the American Models power pickups. Don't forget to put a piece of heat shrink tubing on the wire before soldering. Once the soldering job is complete you can slide the heat shrink tubing in place and shrink it with the warm part of your soldering iron. Finally you need to connect the decoder's motor wires to the light board. I used the holes on the light board where the rear power pickups were originally connected. I cut the orange and gray wires on the decoder to the approximate length needed (don't leave a lot of extra as it will hang into the passenger compartment and be unsightly). Strip a small amount of insulation off of the end of each wire and tin the bare wire. 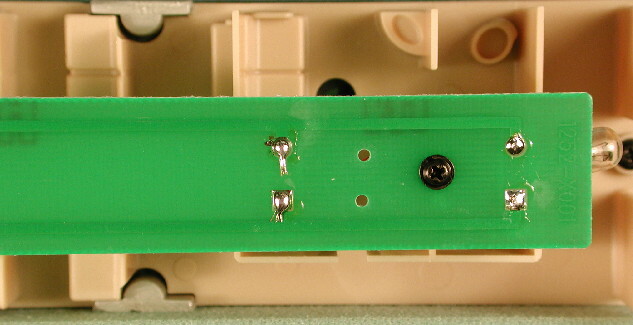 Then using your soldering iron heat one of the holes where you removed the power pickups from the light board. While it is hot push the orange wire through from the underside. Repeat with the gray wire on the other hole. Note the orange wire should be connected to the whole on the same side of the light board as the American Models blue power pickup wires and the red decoder wire. And the gray wire on the opposite side. brush or fine sandpaper in order to get any pickup from the rails at all. Once this is all done you're ready to test your installation. Take the car to a DCC programming track. See if you can change the address. I gave each of my passenger cars a unique four digit address, and when they are running together in same train, I will actually consist them on the layout so that all lighting in the cars is controlled together (except for any lights which are connected to function wires). If you are unable to change the address, you'll need to go back and troubleshoot your installation. If you were successful, then you can proceed to finish up the installation. In the next photo you can see that I used some additional Scotch tape to hold the wires in place on top of the light board. 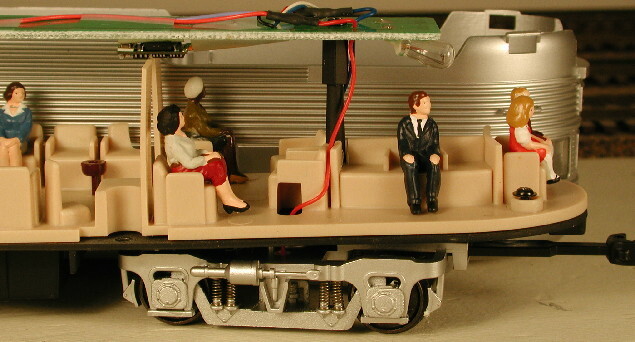 The observation car also offers the opportunity to light and control independently the red tail light. I connected the white and blue wires from the decoder to a Miniatronics 16VDC 30mA bulb and placed it right next to the red lens in the shell. I used electrical tape to hold it in place and keep that light from escaping elsewhere into the cabin. ( Alittle better solution would be to place the bulb in a short piece of brass tubing with the bulb sicking out next to the lens, but I was running short on time.) Now F0 will turn that light on and off independently. Finally to make sure that the F0 was not direction sensitive, I programmed CV51 to a value of 1. To finish the cars, I added some passengers using MTH figures. Here you can see the figures installed before the shell is added, and in the next photo you can see the passengers through the windows. To date I have finished two of the four cars, and plan to complete the work in time to run them at a train show the middle of August 2001. I'll use my American Model Amtrak F40PH with working strobes or American Models 4-6-2 with sound, smoke and lights to pull them. I hope this information will make it easier for you if you are interested in installing DCC in your American Models Budd Co. passenger cars. Perhaps in the future I can upgrade the dining car to have a waiter moving up and down the aisle delivering food!